The subjects of the Astroparticle Physics research group include hardware activities, data analysis and interpretation of results in the field of Very-High-Energy extra-galactic emitters. Our scientific focus is on Active Galactic Nuclei. The research of the Astroparticle Physics group is connected to a number of interesting and cutting-edge projects. Read more about the backgrounds and the projects below. You can also learn about our projects and activities and read our blog at the group's webspace Astrogamma.se. The ALTO research team at the spot where a prototype one detector element will be built. From left to right: Satyendra Thoudam, Yvonne Becherini, Jean-Pierre Ernenwein, Michael Punch. The current generation of extensive-air-shower arrays is represented by the High-Altitude Water Cherenkov Observatory (or HAWC, see www.hawc-observatory.org) experiment located in the Northern hemisphere near Puebla, Mexico. HAWC is an observatory of TeV γ-rays and cosmic rays with an instantaneous aperture covering more than 15 % of the sky. With this large field of view, the detector is exposed to half of the sky during a 24-hour period. Located at an altitude of 4100 meters, HAWC performs a high-sensitivity survey of the sky at wavelengths between 100 GeV and 100 TeV and has already produced exciting results with the first year of operation of the complete array. The HAWC experiment uses densely-spaced steel water tanks to observe the particle content of air showers. Each tank contains four photo-multipliers, and the entire detector comprises 300 tanks in total. Due to the location of the experiment, HAWC can only partially cover the location of the southern sources. 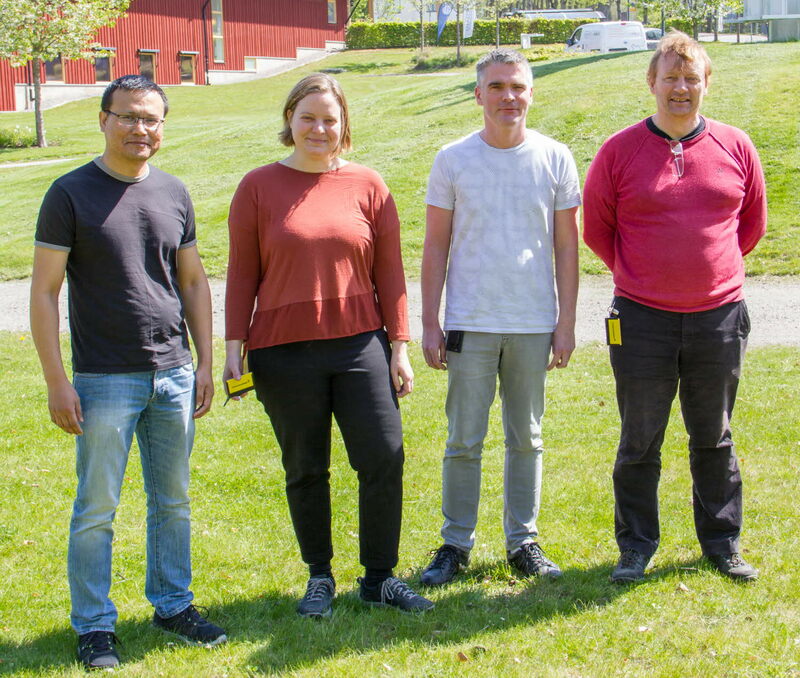 ALTO is the name given by the Linnaeus University Very-High-Energy gamma-ray group to a project we are developing for a wide-field Very High Energy (VHE) gamma-ray detector to be installed at very high altitude in the Southern hemisphere. The construction of ALTO will both complement the HAWC detector in the Northern hemisphere and act as an all-sky monitor and alert system for Southern part of the future CTA Observatory. 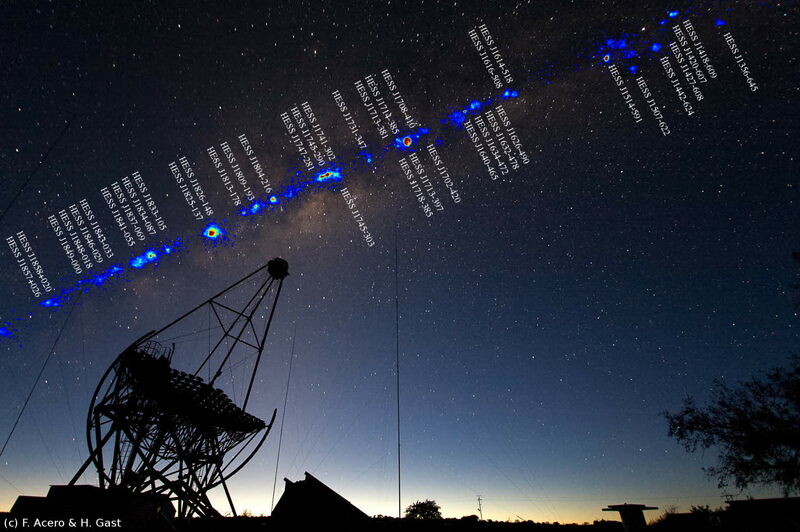 The project is innovative, combining the new technology being developed for CTA together with the knowledge of the technique being gained with HAWC, to design an optimal VHE all-sky survey instrument for the Southern hemisphere, with the sensitivity and threshold to provide a useful trigger to CTA and other multi-messenger observatories for transient events. For ALTO, there are a number of points through which the HAWC design can be changed and improved: lowering the energy threshold for detection by increasing the detector altitude; increasing the background rejection and so the sensitivity by using finer grained spacing of the detector tank and including a scintillator detector layer for background rejection by muon detection; use of more more modern electronics derived from that being developed for CTA, including Analogue Memory ASICs for charge conversion and the White Rabbit technology (CERN) for timing distribution and time-stamp system. The goal of ALTO is to reach a sensitivity which is a factor of at least 5-6 better than the current HAWC sensitivity. Such a sensitivity would allow to catch VHE AGN flares and thus to study the black hole/jet emission in more detail. The full ALTO array will provide unique and excellent scientific output in the search for VHE emission from Cosmic Gamma-ray sources above a few hundred GeV from the South, including AGN detection and monitoring of AGN high states. So, ALTO will be uniquely placed to complement the Southern site of the CTA observatory. More information can be found at the ALTO website. The extragalactic sky at TeV energies offers a unique opportunity for examining a complete laboratory of cosmic-ray physics, astrophysics and fundamental physics. Extragalactic TeV sources give the possibility to investigate where and how cosmic rays are accelerated to the energies detected at the Earth, and, more generally, to study what are the acceleration mechanisms involved in the class of the most abundant type of objects, the Active Galactic Nuclei (or AGNs). AGNs are compact regions, located at the centre of some galaxies, composed of a supermassive black hole accreting material from the surrounding disk and jets with apparent superluminal motions. In leptonic scenarios, the lower-energy component (below X-rays) of the emission is generated by synchrotron radiation of relativistic electrons moving inside the jet, while the higher energy component (above X-rays) is due to the inverse Compton scattering of the electrons off the photons of the preceding synchrotron photon field, or off the photons provided externally by other regions of the source. The VHE (E>100 GeV) gamma-ray emission could also be explained by the interactions of relativistic protons with ambient photons or magnetic fields in hadronic scenarios. Some of these AGNs have extreme properties which are thought to be related to the relativistic bulk motion of the emitting region at small angles to the line of sight to the observer, and as a result these objects - called BL Lacs - can be highly variable in all energy ranges and are thus monitored at all frequencies. Variability is a key factor for understanding the origin if the VHE emission, the explanation of this phenomenon being extremely complicated with an hadronic component. The short-term variability, seen for instance by H.E.S.S. in the blazar PKS 2155-304, helps to constrain the size of the emitting region in relativistic jets. The study of the Spectral Energy Distribution of AGNs is, however, not sufficient to completely disentangle the origin of the VHE emission. One possible line of research is to try to identify the spatial origin of the emission by using the spectacular properties of radio-galaxies, AGNs observed with a large angle between the line of sight and the jet axis. In recent years gamma-ray astronomy has gone through an extremely exciting period with the operation of Imaging Atmospheric Cherenkov Telescopes (IACTs). The keys to this success have been the largely improved angular resolution and the background discrimination capability against the large amount of cosmic background, thanks to the stereoscopic view of the air shower and thanks to the fine pixelization of the imaging cameras. At the beginning of 2008, after four years of tremendous H.E.S.S. achievements with the detection of the brightest sources, it was necessary to attempt to increase the detection sensitivity in order to reach the fainter targets, and this just before the advent of HESS-II and CTA. It was in this context that a new analysis strategy for a powerful background rejection has been developed, based on a combination of several multivariate parameters in a Boosted Decision Tree environment. Some of these discriminant parameters were already known in the field, and some of them have been newly-defined with the purpose of enhancing the event separation. Since the end of 2009 the analysis strategy is also applied to CTA in the frame of the Monte Carlo working package, where efforts are devoted to the understanding of the performance of the CTA candidate arrays. Radiation at gamma-ray energies differs fundamentally from that detected at lower energies: GeV to TeV gamma-rays cannot conceivably be generated by thermal emission from hot celestial objects. The energy of thermal radiation reflects the temperature of the emitting body, and apart from the Big Bang there is nothing hot enough in the known universe to emit such gamma-rays. Instead, we find that high-energy gamma-rays probe a "non-thermal" universe, where other mechanisms allow the concentration of large amounts of energy onto a single quantum of radiation. In a bottom-up fashion, gamma-rays can be generated when highly relativistic particles - accelerated for example in the gigantic shock waves of stellar explosions - collide with ambient gas, or interact with photons and magnetic fields. The flux and energy spectrum of the gamma-rays reflects the flux and spectrum of the high-energy particles. They can therefore be used to trace these cosmic rays and electrons in distant regions of our own galaxy or even in other galaxies. High-energy gamma-rays can also be produced in a top-down fashion by decays of heavy particles such as the hypothetical dark matter particles or cosmic strings, both relics which might be left over from the Big Bang. Therefore, gamma-rays provide a window to the discovery of the nature and constituents of dark matter. Current systems of Cherenkov telescopes use at most four telescopes, providing best stereo imaging of particle cascades over a very limited area, with most cascades viewed by only two or three telescopes. An array of many tens of telescopes will allow the detection of gamma-ray induced cascades over a large area on the ground, increasing the number of detected gamma rays dramatically, while at the same time providing a much larger number of views of each cascade. This results in both improved angular resolution and better suppression of cosmic-ray background events. In a possible design scenario, the southern hemisphere array of CTA will consist of three types of telescopes with different mirror sizes in order to cover the full energy range. The northern hemisphere array would consist of the two larger telescope types. The low energy instrumentation will consist of a few 24 metre-class telescopes with a moderate field of view (FoV) of the order of 4-5 deg. The medium energy range, from around 100 GeV to 1 TeV, will be covered by telescopes of the 10-12 metre class with a FoV of 6-8 degrees. The high energy instruments, operating above 10 TeV, will consist of a large number of small (4-6 metre diameter) telescopes with a FoV of around 10 degrees. From time to time, we have vacancies like PhD positions. All current vacancies at Linnaeus University can be found at Work at the university.